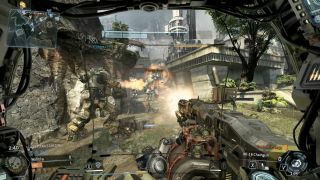 On the verge of Titanfall's beta - and less than a month from its full release - we sent Phil into the belly of Respawn Entertainment's men 'n mechs shooter. Having recovered from his experiences inside a giant machine of murder, he and Tom sit down to talk about the game's Call of Duty lineage, the nimble manoeuvrability of its pilots, and the joy of calling down rocket-spamming robots. For more on the Titanfall, check out Phil's full hands-on preview .